You can create your own balls using your own original graphics and sounds, or just tweak an existing ball from the original game - or anything in between. The Editor is written in Python and so is fully cross-platform capable. You will need to have purchased the full game. Windows Users, if you want to test your Goo Balls directly from the Editor (and you will want to), you also need to update to the latest version. For easy integration of your addins into your or other players games. Get it here. The first time you run World of Goo Ball Editor it will ask you to locate the WorldOfGoo folder you want to edit. If you are familar with GooTool you will know that it always preserves the original game files and creates a separate folder which holds the modified version of the game. If you haven't yet, you should run GooTool and create the "modded" folder now. This is the folder you should use for the Editor, since you should never modify the files in the original game folder. It is often best to create your modded folder in a private folder, be that "My Documents" or your "Home Folder" or on a separate drive somewhere. Wherever you create it, you will need to ensure you have full permissions to read/write/delete files and create folders. The toolbars should be fairly self explanatory - all the buttons have tooltips telling you what they do, just hover of them for a moment before clicking. The Ball View area is Tabbed, so you can have several levels open at once, and you can switch between each view as needed. This also means you can copy and paste things from one ball to another (described in more detail later). It will help you to design Goo Balls and find your way around if you have some understanding of how World of Goo (and hence the Editor) structures the data. 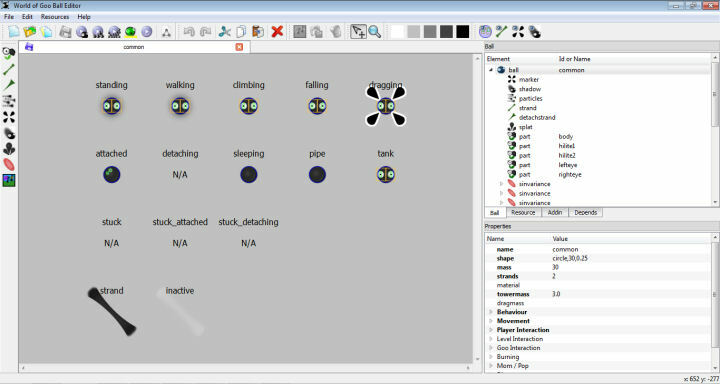 World of Goo builds a complete ball from 2 main XML files plus other information taken from a number of game-wide (global) files, as well as the actual image and sound files. Holds all the information about how the ball looks (graphics, particle effects etc), how is moves, what it can do, what the player can do with it... pretty mich everything. Holds a list of all the image and sound files used in the level and gives each one an ID. This ID is then used to apply images/sounds to items in the level, rather than using their actual filename. 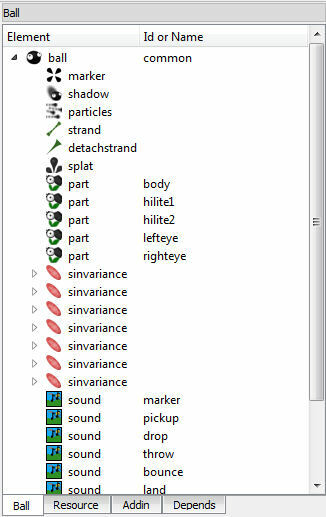 Each of these files is represented as a Tree View in the Tree Tabs panel. The tree begins at the top with a "root" item. All the different objects that make up a ball are listed as children underneath the root item. Open Image. Whenever you add an item to your ball, it will be added into one of these trees. You won't need to remember which one, because when you select the item in the graphical view, the entry for it will be highlighted in the Tree, and vice versa. 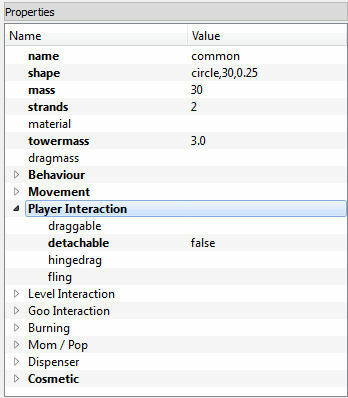 When you select any item, a list of its properties/attributes is displayed in the panel below the trees. Open Image. These properties cover every possible value or setting that can be applied to an object of that type. Some of these you can also change using your mouse (position, size, and rotation) by selecting and dragging objects in the graphical view. Others you will have to enter or select by hand in the properties pane. Many of these properties you will never have to touch, except in advanced ball designs. I'll make a tutorial for a Goo Ball...lets see...4 strands, detachable, springconst 9, looks like BeautyProduct with eyes, how about? i finally got a goo ball open! What happened to the tutorial? for this and movie editor? Check out my Awesome THREE Levels!!!!!!!!! They were never created. Feel free to make your own. Guess what guys! 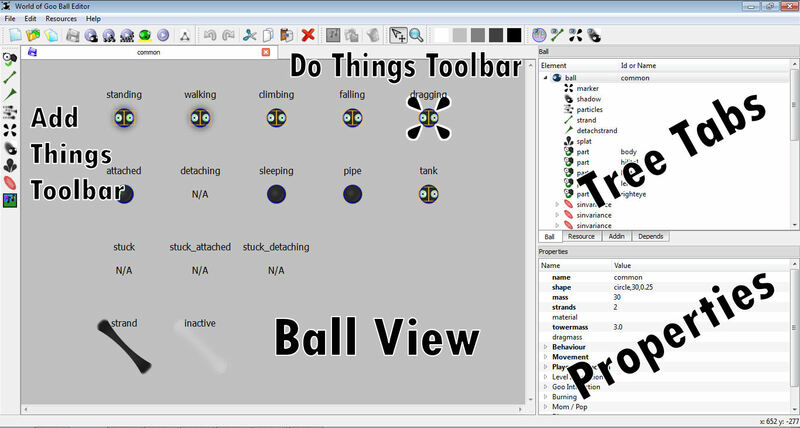 A user named Jim2102 has made a tutorial video for the Ball editor. Its really useful!